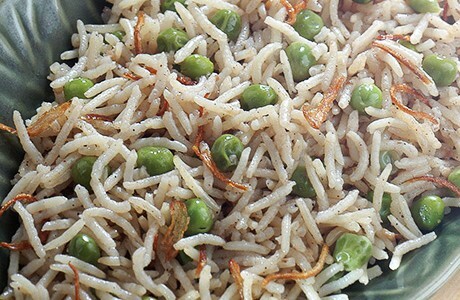 Pilaf is a delicious dish in which the rice is cooked and stirred through with onions as well as a mix of aromatic spices. This version, which contains the sweet, balancing flavour of peas couldn't be easier to make. Heat the ghee in a wok; add the cumin seeds. When they crackle, add the onions and sauté until golden. Add the garam masala, stir and add the rice. Sauté for 2 minutes, until the rice is well coated with ghee. Add 3 cups water and bring to the boil. Reduce heat, add the green peas and salt; stir Cover and cook until all the water is absorbed and the rice and peas are done. Garnish with fried onions.